David Beckham makes Elle history this June by featuring solo on its front cover in honour of the Olympics. We can’t decide which of the two covers we prefer – we might just have to buy them both. Last night’s Glamour awards drew the great and the beautiful to London from all around the world, and there was some serious fashion clout on show. Our favourites were Jessie J, Lily Collins and Reggie Yates – each looked impeccable and unique. We’re gearing up for a long weekend of nice (ish!) weather, jelly and ice cream, and lots of bunting thanks to the golden jubilee. Whatever you’re doing with the extra days off, have a lovely time! All this time in the sun has given me a lovely sunkissed glow, but it can be hard to maintain your tan when dryness has set in. Stave off the onset of peelies (dry, peeling skin) with a deeply nourishing body lotion or after sun. Stella McCartney has designed the British kits, Armani and Prada are catering for the Italians and Ralph Lauren is looking after the Americans. While Australia secured Adidas as their designer, the traditional look of their kit has fallen a little flat in the face of the couture power three. Don’t get overzealous when enhancing your tan – think subtly bronzed rather than gilded! Too Faced have launched a perfect capsule summer collection of bronzers and highlighters for the face and body, and our favourite product is the Too Faced Royal Oil, a tinted body oil with added golden glimmer. 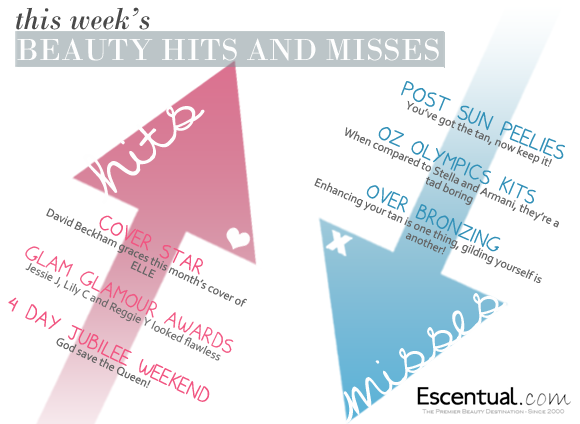 This entry was posted on Thursday, May 31st, 2012 at 1:00 pm and is filed under Hints & Tips, Skincare, Sun and Tanning. You can follow any responses to this entry through the RSS 2.0 feed. You can skip to the end and leave a response. Pinging is currently not allowed.